Ryan Elementary is a healthy school focused on student, staff, and community wellness. We cultivate and encourage health-promoting behaviors because we know healthy students are better learners. Recent research on adolescent brains has shown that nutrition and physical activity directly affect learning. Our wellness efforts are aimed to assure all of our students are ready to learn and succeed. At the heart of Ryan's wellness efforts is the Healthy Hawks Cafe. Through a generous grant, Parents, grandparents, teachers, community members, and students all helped make this project a reality. and volunteers' hand work, the Ryan cafeteria was "redesigned" to represent the healthy habits students are encouraged to pursue. Ryan has an 80/20 Shared Foods policy that states, 80% of foods shared at celebrations and community gatherings must be healthy & nutritious, while 20% can be indulgent. This policy allows for a balanced approach to nutrition, prevents sugar overload, and has generated some fun competition between parents to design the best healthy food "art." Daily classroom movement breaks, also known as brain breaks, are done on a daily basis. Physical activity and free movement is encouraged at recess with an equipment cart and organized games of kickball, soccer, flag football, and more. 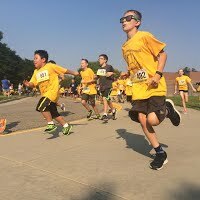 Students also have after-school physical activity opportunities which have included Karate, Family Fitness, Yoga, Bike Club, and the famous Healthy Hawks Run Club. The community run club trains together in preparation for the Ryan Hawk Hustle 5K, our yearly community-based fundraiser. Ryan is also an active Safe Routes to School participant. Through this program, families are encouraged to walk or bike to school to help improve health and lessen their environmental impact. Many of our wellness leadership skills, while modeling and encouraging health to their peers. Our student leaders have earned some great opportunities through FUTP60; one highlight being a visit to the White House to participate in an annual meeting of the President's Council on Fitness, Sports, and Nutrition. We have received the top FUTP60 award, Touchdown School, for several years. efforts are student-led thanks to the Fuel Up to Play 60 program. This wellness program funded by the NFL and National Dairy Council encourages students to eat nutritiously and get 60 minutes of physical activity every day. All of these efforts are championed through our school wellness team, which includes our principal, parents, teachers, and students. The team welcomes any Ryan community member to join. If interested, please contact the school for more info.